What’s good about these ingredients: Coconut flour has been used mainly to make it gluten free and nut free so it’s kind to sensitive digestive systems. Coconut flour also doesn’t give you that high blood sugar / insulin spike that you can often get with refined white flours. 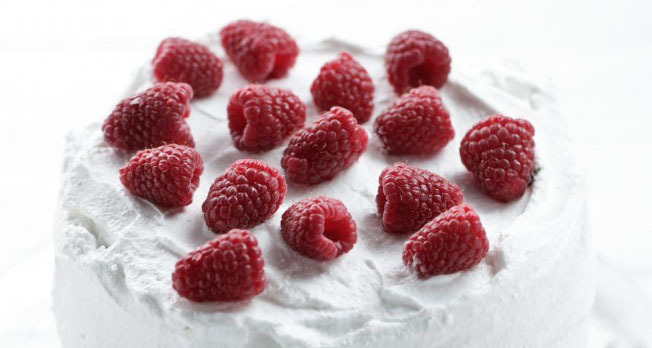 Raspberries and other berries are high in antioxidants which can help to neutralise free radicals. They also marry perfectly with coconut making them taste amazing. Eggs are high in protein and contain all the essential amino acids needed for growth and repair. Macadamia nut oil was used to make this cake, which works really well with baking – giving it a lovely buttery flavour. The oil is also an anti-inflammatory fat, that is kind to your arteries and can support good health and wellbeing. If you want this cake to be nut free make sure to use a good cold pressed coconut oil, butter or olive oil instead. This recipe is enough for 1 x 18 cm / 8 inch round cake. Preheat your oven to 160 C / 320 F. Whip the eggs, vanilla and honey for 10 minutes until light and creamy. Pour in the oil or butter with the eggs still whipping and mix well. Add the coconut flour and baking powder and mix until combined. Fold in the berries. Spoon the batter into a lined round 18 cm / 8 inch baking tin Bake for 45 minutes or until cooked through. Test the cake and make sure it is evenly cooked through before removing the tin from the oven. Cool for 30 minutes before lifting out from the tin to completely cool. 1 x 18 cm cake serves 12 people. 1. Thick Greek Style yoghurt or coconut yoghurt. 2. For yummy cashew / macadamia nut cream combine 1 cup of raw cashew or macadamia nuts with 1/2 cup of water, coconut milk or orange juice and a little vanilla. Blend in a good high speed blender until smooth and creamy. Allow to thicken and settle in the fridge before using. 3. To make the vanilla soy cream, combine in a high speed blender like a Vitamix 300 g silken tofu with 2 teaspoons organic maple syrup and 1 teaspoon natural vanilla extract. Process until smooth and creamy. For a thicker cream, add 50 – 80 g cashew or macadamia nuts and process until creamy. 4. For a chocolate cream frosting combine 2 ripe avocados, 1/4 cup cocoa or cacao powder, 1/4 cup honey or organic maple syrup, a pinch of sea salt and 1 teaspoon vanilla bean paste. Blend in a Vitamix until smooth and creamy. Add a little splash of water for a smoother and fluffier consistency. 5. For a creamy cheesecake style frosting, combine 250 g (9oz) soft cream cheese such as quark with a little lemon zest, juice, vanilla and a little maple syrup or honey to taste. Beat well until combined and creamy. 7. Make a white chocolate ganache by heating 120 ml coconut cream or quality organic cream in a small pot. Once boiled, remove from the heat. Add 200g of quality white chocolate pieces and mix through until it has melted through the cream and look thick and glossy. Allow to cool at room temperature until you have a spreadable consistency. Top with coconut flakes and berries.